You know the multitude and diversity of my needs. full of misery, but full of hope. I entreat your charity, O great Saint. which I now humbly lay before you. who is admirable in His Saints. Imprimatur: + Carolus Hubertus Le Blond, Episcopus Sancti Josephi, January 1952.
we rely on your aid. to Jesus Christ even to death. please use the following link for your donation. Remember to include your prayer request. The Novena begins at the Sanctuary in Mugnano del Cardinale on Monday, August 4th. All of her friends throughout the world are invited to join us in praying to our powerful wonder-worker during these special days. Prayer for Each Day of the Novena. 3. Assist at Holy Mass in her honor and visit one of her statues or pictures, if you can. 1. 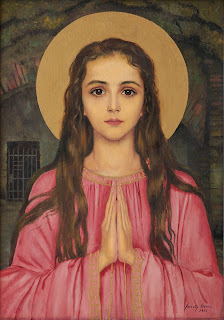 Consider that Saint Philomena, in dying for Jesus Christ, had to endure the jeers, the sarcasms, the outrages of her persecutors, of her executioners and of the majority of the witnesses to her torture… She was none the less generous, none the less constant, none the less joyous in the public confession of her faith… If the world gave you a similar chalice to drink would you have enough courage to drain the bitterness of it with the same kind of sentiments? Oh! What do the jokes, the scorn, or the most unjust or bloodiest persecution of the world matter?... Can anything ever dishonor a soul that is honored by God? Fear nothing… Follow out your road… It is leading straight to the possession of eternal glory. 1. Consider that when Saint Philomena died, for love of Jesus Christ, to all the things of this wretched world, she entered into the joy of eternal life… Yes I am certain, she said in her heart: "the supreme Judge will give me the crown of justice which He has promised me in return for all the fleeting goods which I sacrifice to His Love." 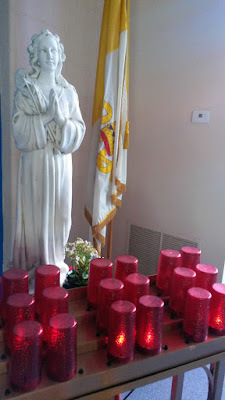 She dies… and behold her in the tabernacle of God, with the Saints who follow the Lamb… Are these the thought which I try to have when I find myself confronted with some sacrifice?... What impression do they make on my spirit?... To what side do they make the balance fall?... Ah! in order to gain all, the Saints used to say: "Let us lose it all"... and what shall I say? 1. Consider that Saint Philomena, having sacrificed everything in this miserable world for Jesus Christ, received back from Himself in this world more than the hundredfold of what He had given! What renown! What power! What glory! What greatness humbled at her feet! What throngs of pilgrims to her different Shrines! What festivities in her honor. What tributes of reverence have been paid to her! What an ardent longing to get possession of her relics! Thus precisely does God fulfill His promises. Ah! If only we maintained our promises to Him with the same fidelity! But when we deprive Him of His glory, do we not perhaps deprive ourselves of great merit and favor both in this world and in the next?... Courage, therefore… Be faithful in order that God may be faithful with you. God the Father of Heaven, All: have mercy on us. God the Son, Redeemer of the world, All: have mercy on us. God the Holy Spirit, All: have mercy on us. Holy Trinity one God, All: have mercy on us. We implore You, O Lord, by the intercession of Saint Philomena, Virgin and Martyr, who was ever most pleasing to Your eyes for her eminent purity and the practice of every virtue, pardon us our sins and grant us all the graces we need. Through Christ our Lord.